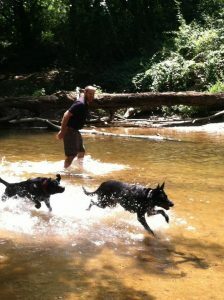 Scott Curry is the proud owner and head trainer of Off Leash K9 Training Maryland. Scott was born and raised in a shore community in New Jersey. As a teenager Scott earned the rank of Eagle Scout with the Boy Scouts of America. 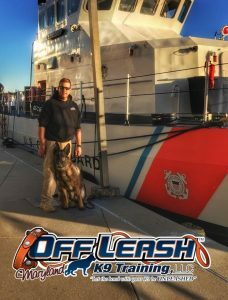 Scott along with his wife Jennifer purchased Off Leash K9 Training, Maryland in 2012 and runs the day to day operations of the company. After High School, Scott was employed by a Sherriff’s Department. He assisted the K9 handlers on a weekly basis on detection and patrol work. At the age of 21, Scott enlisted in the U.S. Coast Guard. It was during this time Scott started working with drug detection dogs while searching freighters and small fishing vessels in the Atlantic Ocean and Caribbean Sea. After September 11 the basic mission changed for the U.S. Coast Guard. Scott found that his new unit was vastly tasked with more Homeland Security related missions. Soon he found himself and his shipmates working with bomb detection dog teams. In 2004, Scott left the U.S. Coast Guard to take a position with the Department of Homeland Security in the District of Columbia. Since then he has worked side by side with dog teams specializing in bomb detection, narcotics detection, and protection / patrol canines protecting high level dignitaries and the facilities they use. Scott uses his experience to handle Any Breed, Any Age, Any Size. He has worked with dogs from 3.5lbs to 175lbs. He loves to spend his free time working with his Belgian Malinois "Boo", volunteering as a Scout Master with his boy's troop or enjoying an Oriole's game at the yard with his family. Scott has now teamed up with the top rated dog trainer in Northern Virginia to bring this tried and proven system to the Baltimore Metropolitan area. 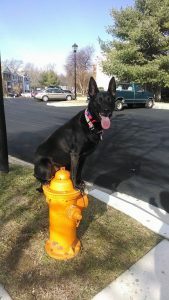 Check out our Off Leash K9 Training Maryland reviews on Google+ and Yelp. Check out how our dog training can help you!